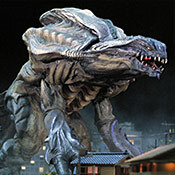 Toho submitted the film to the US copyright office on December 12th, 1999 with the registration number of PA0000967584. The title used was its international one, Godzilla 2000 Millennium, with no alternate listed on the registration. During pre-production, where producer Shogo Tomiyama announced the movie would begin filming on July 10th, it was stated that they wanted to produce this movie as a trilogy in a "different world, unconnected to the previous films." The comment is vague on if the Millennium series was originally supposed to feature continuity or not between its entries. Either way, the concept of this being a trilogy undershot how long the Millennium series ran for. Cited in issue #40 of G-Fan, which was printed in 1999. When producer Shogo Tomiyama was asked about Godzilla vs. Destoroyah (1995) originally supposed to be the last Japanese Godzilla film of the 20th century, he admitted that was originally correct. He admitted further that the idea to create Godzilla 2000: Millennium was "made abruptly". In fact, previously there had been no plans to create another Godzilla film until 2005. This change in plan came about because of GODZILLA (1998) and feeling that after seeing the movie they "couldn't keep silent until 2005". Noted in issue #40 of G-Fan. 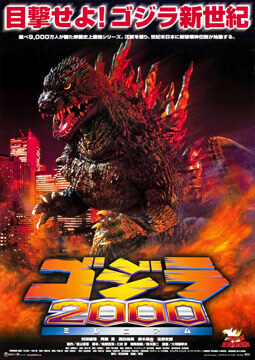 Although nothing is stated in the movie to give the impression, Godzilla 2000: Millennium is connected through canon with Godzilla (1954). This means the events of the original Godzilla movie occured in this film's timeline. This fact is mentioned in the publication New Godzilla Walker - The New Legend of the King of the Monsters (ISBN: 9784048956321). Producer Shogo Tomiyama stated that the target audience for this film were people in their thirties. This quote is seen in issue #40 of G-Fan.